Seven persons A, B, C, D, E, F and G are living on a different floors of an eight storey building in such a way that the ground floor is numbered one and the above one floor is numbered two and so on till the topmost floor is numbered eight. One of the floors in the building is vacant. They all are working in different public sector companies viz., HPCL, NTPC, BHEL, BSNL, IOCL, HAL and BPCL but not necessary in the same order. 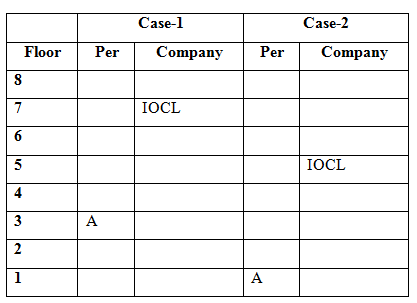 Only three floors are there in between the floors on which A and the one who is working in IOCL lives. A does not live above the one who is working in IOCL and lives in odd numbered floor. Neither the ground floor nor the topmost floor is the vacant floor. Only two persons are living between E and the one who is working in HAL but both of them are living in odd numbered floors. A does not work in HAL. The one who is working in BSNL lives immediately above E. As many persons living below G is same as the persons living above C. The one who is working in HPCL lives immediately below G. E does not working in HPCL. Only two persons are living between G and F. As many floors between E and the one who is working in NTPC living is same as the floors in between B and the one who is working in IOCL. More than three persons are living between the one who is working in BHEL and Vacant floor. 1. Who among the following persons living in second floor? 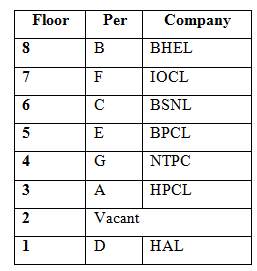 Only three floors are there in between the floors on which A and the one who is working in IOCL lives. A does not live above the one who is working in IOCL and lives in odd numbered floor . Neither the ground floor nor the topmost floor is the vacant floor. Only two persons are living between E and the one who is working in HAL but both of them are living in odd numbered floors. A does not work in HAL. The one who is working in BSNL lives immediately above E.
As many persons living below G is same as the persons living above C. The one who is working in HPCL lives immediately below G. E does not working in HPCL. 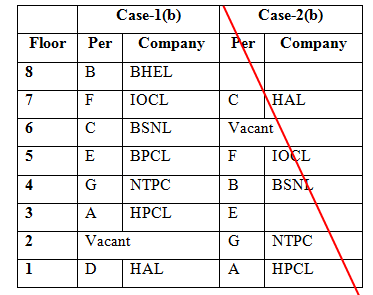 Only two persons are living between G and F.
As many floors between E and the one who is working in NTPC living is same as the floors in between B and the one who is working in IOCL. More than three persons are living between the one who is working in BHEL and Vacant floor. 2. D is working in which of the following companies? 4. How many persons living between A and the one who is working in HAL? 5. Who among the following persons lives on the topmost floor? Ramesh starts walking from point A towards west for 5 km to reach point B. 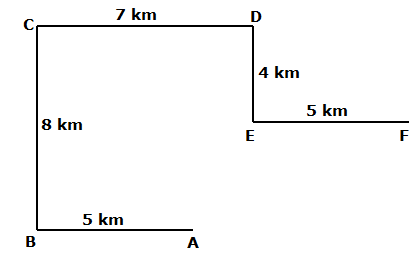 From point B he took a right turn and walks for 8 km to reach point C. From there he again took a right turn and walks for 7 km to reach point D. From point D, he took a right turn and walks for 4 km to reach point E. After that he took a left turn and walks for 5 km to reach point F.
6. If point H is exactly between points B and C, then what is the shortest distance between H and F? 7. Point D is in which direction with respect to point A? Direction (8-10): Read the following information carefully and answer the questions given below. Seven persons P, Q, R, S, T, U and V are in a family in three different generations. T is the only son P. U is the son-in-law of R, who is the husband of P. V is the son of S. There are three married couples in the family. S is not the wife of U. 8. How many female persons are there in the family? 9. If W is married to V, then how is T related to W? 10. 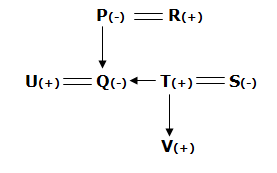 How is P related to V? 1) Who among the following persons living in second floor? 2) D is working in which of the following companies? 4) How many persons living between A and the one who is working in HAL? 5) Who among the following persons lives on the topmost floor? 6) If point H is exactly between points B and C, then what is the shortest distance between H and F? 7) Point D is in which direction with respect to point A? 8) How many female persons are there in the family? 9) If W is married to V, then how is T related to W? 10) How is P related to V?